Frankly, they don’t regret the inconvenience, nor do they regret the loss of customers apparently. An ‘export regulations’ change might as well mean you can add Canada to the list of terrorist nations, so I can’t order some food grade tubing, metal shaft couplers, or worm gears. 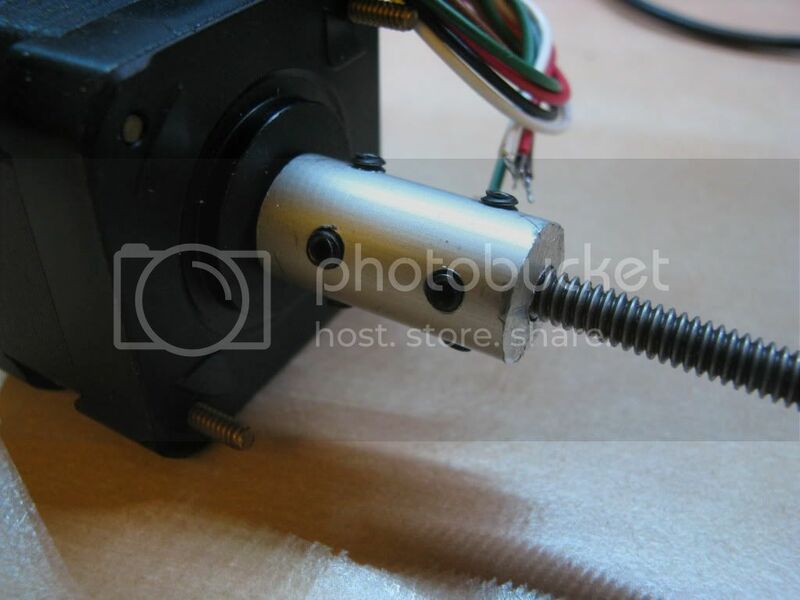 I might be in a slightly snippy mood because I spent 3 hours over a crappy drill press to make a low precision shaft coupler to try out an idea of mine. So I’ve been busy with another semesters final exams, and I’ve been cranking on getting projects done after I finished my last exam. I’ve got a how-to video on extracting acetylsalicylic acid from aspirin pills, and subsequent experiments to do using this acetylsalicylic acid. On a related note, I now despise my computer and Adobe Premiere CS3. Dear santa, buy me a Macbook pro with Final Cut pro. Adobe Premiere Pro crash count at the time of this blog post is up to 36. Seriously though I have a few more things planned, and if my attempts at videos fail due to Adobe software being buggy, I will try to publish illustrated guides. I have some organic and some organometallic reactions to show though. This months downtime brought to you by…. 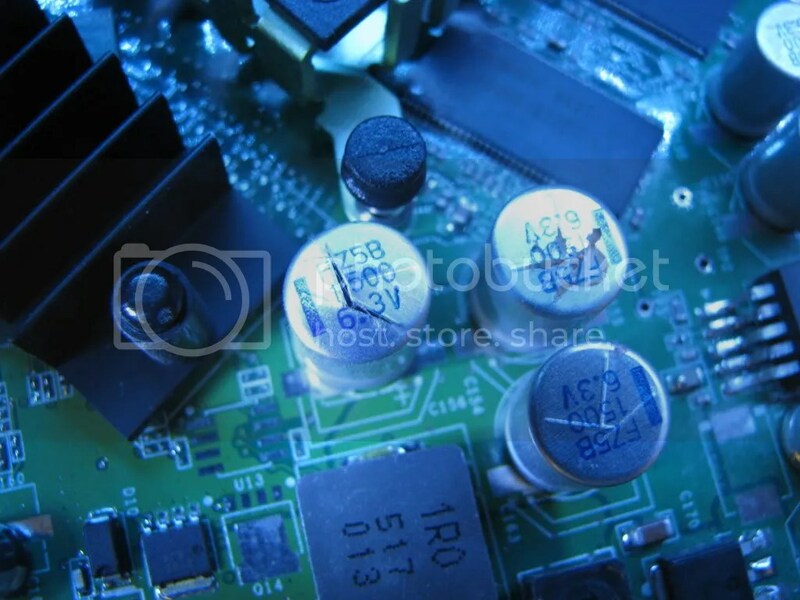 Exploding capacitor Co. ensures that your product fails at the precise moment when user need is greatest using our patented failinite technology. Ok, so 9am classes on Monday, not the best thing – especially when fighting the tail end of a cold. First and foremost – people need to watch where they are walking. This is a long ongoing rant of mine, but as a greater aspect, people no longer seem to care about other people by basic consideration at all. When you walk down a hallway people now expect you to move out of their way, its rediculous. When the hallway is narrow to 2 people and you can’t move, they ram through anyway and give you dirty looks as a result. I don’t want to seem like a jerk, but I think that this general lack of respect for other human beings is due either to generational and/or racial change, *or* that corporate media has brainwashed people to care about nothing other than consumerism. 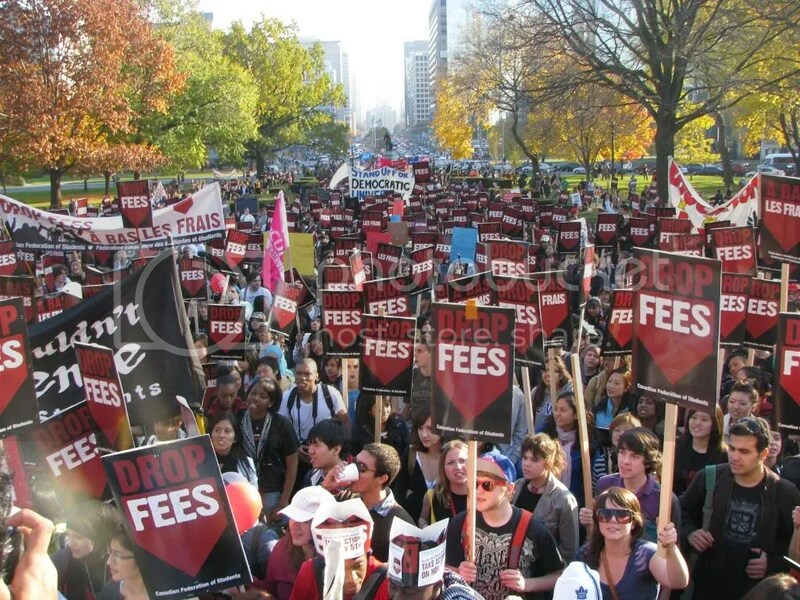 On November 5th, 2008 university students from across Ontario gathered in protest against increasing tuition fees at Queens Park in downtown Toronto. Why would students want lower tuition fees? Are they asking for a free ride and handouts? Are they not working part time jobs and struggling to get through their 4 years of university? Some of the more self-absorbed public commentary (likely those whose cars were stuck in traffic due to the rally, and are right-wing Conservative) say that students don’t work, haven’t applied for bursaries or aren’t deserving of scholarships. The other common knee-jerk reaction of people whom I surveyed through the crowd was that decreasing tuition fees would raise their taxes. My thought to this is that there is a significant amount of disinformation: firstly, the student body of Ontario protested because of continually increasing tuition fees which do not account for simple inflation rates. We protest against the corporate monopoly on education, and the improper distribution of taxpayer money. If you examine how much it costs to live as a student, even with a job many students exit their undergraduate degree with over $20,000 in debt in Ontario (some programs which have already been deregulated have $10,000 per year tuition, significantly increasing overall debt, values were averaged). Between $150 textbooks which get revised every year to prevent used-book sales, $7000 tuition, housing, utilities, food, and a frugal entertainment budget, nothing is left over from a part time job. Another ill-conceived concept is that students do not work, two problems arise. Firstly many students do work part time jobs (any suits should recognize the minimum wage student serving you your Starbuck’s coffee every morning, or packing your groceries in the evening). Secondly, not all undergraduate degrees are the same – some social science or humanities degrees require less in-class time allowing for greater flexibility in work schedules, while science programs typically have multiple 4-hour labs, eliminating the ability to work and study for most science students (particularly in upper-years, and especially in my case). The next topic of interest is taxes – would decreasing tuition fees increase taxes? Perhaps, however the students of Ontario were not asking for taxation to increase, they were asking for a redistribution of funds. Why spend $460 million on a war that 61% of the country does not support in the first place? A country’s first duty should be to its own people, and not necessarily due to foreign pressure; therefore Canada should focus on educating its own people in order to secure a stable skill and knowledge based economy for the future. While a barrier to entry should exist to education, it should not be deregulated by those who do not hold the people’s best interest in mind. While American university tuition fees do range in the $15+ range per year, that is because they were deregulated long ago, students in Canada don’t wish for that to happen and keep pushing for government aid. Another thing I find troubling is that dozens of photographers and a handful of videographers were documenting the event (myself included), however I find the lack of grassroots community media troubling. While there were dozens of people with dSLRs with photos worthy of the news (or professional video cameras), even handheld cameras could contribute to the available media available for use by the very people who organized this to document the event themselves. As a call to all students from the protest: ask your student newspaper if they want any photos of the event, or gather together any video clips and put them on Youtube, if you put the media out there people will take interest. So in closing, to the students of all universities everywhere: raise awareness nicely, save money and get a job, but don’t let the big corporations control what you do, say, and think. Note: photos are available for use under a Creative Commons non-profit license. Also, if you do use the photos, link my blog as well.